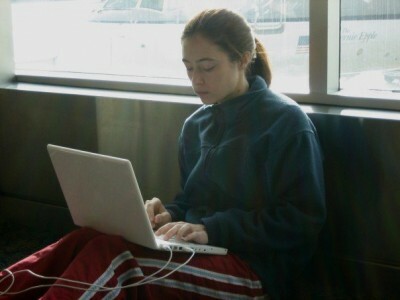 Writing at the airport, a few months before finding out I’d been accepted to graduate school. When I was younger, writing was easy. I was always naturally talented when it came to putting words on paper (or typing them onto a screen). I didn’t learn how to revise until graduate school, and even then, it was only my creative writing; the critical papers I turned in were always first drafts. It might take me half an hour to write a paragraph, but when I had it, I had it—though it was more usual that I’d write much more quickly. But before then, before I began my work toward a graduate degree in writing, before I switched to studying a writing-related field in undergrad, writing was just a hobby. One of the reasons I did switch to professional writing in my third year of college was because I spent more time writing then I did studying for my engineering classes. There were no stakes when it came to telling stories like there were when I completed a problem set of studied for an exam, and in the fall of my junior year, I “won” National Novel Writing Month by writing 50,000 words of a novel in thirty days. Despite feeling increasingly lost in my major (I switched from engineering to microbiology, something I’ll never understand since I’d hated the one bio class I’d taken), writing felt increasingly safe and wonderful. It stayed that way even after I became a professional writing major. I took classes on grammar and editing, on visual rhetoric and web design. I turned in first-draft papers and received 4.0s, even when I wrote them in their entirety the same day they were due. (This is the point where I hope none of my students are reading this….) My creative work was still kept separate. Even when I began applying for MFA programs (and yes, the “revising” I did on my writing sample before sending it off amounted to changing a few words and fixing a few commas), writing remained a place of glorious refuge. And then I got to graduate school, and suddenly things weren’t so easy. Some of my classmates were so very talented, and for the first time I wondered about my ability to live up to that level of skill. My first short story, one I was really pleased with, was politely but poorly received—I didn’t realize just how poorly until we workshopped my second story and everyone exclaimed how much better it was. I started sending out work to be published, and like an idiot, I sent my first piece to Tin House. I told myself I wasn’t surprised when I was rejected, but in some ways I was (I was still learning the crazy level of competitiveness at literary journals, especially the ones in the upper tier). I began to wonder why I’d given up my highly lucrative future as an engineer to do something I was only okay at, and because I didn’t know how to revise (that lesson didn’t come until I started working one-on-one with my thesis advisor), I started to lose my nerve. I only wrote when I had to. The rest of the time I was too scared to open up a Word document and see what type of crap I’d spew onto the page. Instead I threw myself into editing—both critiquing my classmates’ work and through my work with Willow Springs. I began to wonder if it had all been some big mistake, if I was a better editor than a writer, and if my professors had been wrong to let me into graduate school. I worried so much about this, in fact, that I called my mother crying a few weeks before my thesis defense and told her I couldn’t do it, that I wasn’t good enough to get the degree. That I passed my defense easily and enjoyably—it’s one of the times I had the most fun in all of my MFA program—only temporarily stilled my worries. Since then, I’ve had ups and downs with writing. I had my first short story accepted at PANK, one of the journals on my list of dream-journals, and I wrote a handful of book reviews for The Collagist. But I’ve also had frustratingly long droughts during which there weren’t any nibbles, let alone bites. And in these times of rejection rejection rejection, I find myself wondering again: am I good enough? do I have what it takes? I’m in one of those droughts right now. Aside from a few spurts in December when I was laid out with a broken foot, I haven’t written, revised, or submitted any fiction. I haven’t even opened the files to look at my work. I’m so afraid. So very afraid of what I’ll find. I know I can write stories that are good, but being a good writer isn’t enough for me anymore, and while I know that only practice can take me from good to great, I haven’t yet figured out how to handle all the disappointment that comes with getting better, because you can’t get better without failing. And I don’t know how to fail. Sometimes I still miss those days when the writing I did came without consequences, when I could write and write and write and still think highly of myself—highly enough that I thought, yeah, I can do this for the rest of my life. There was no risk then, but no reward, either, and I crave that reward more than almost anything else in the world. At some point, I’ll have to decide if my risking my pride and facing my fears is worth having a shot at getting what I want. Wow. It has been a long time. I might mean since we worked together but I could as easily mean since I opened your blog entry in a tab and then tried to ignore it. If I read it, I might see something discouraging. If I closed the tab, I might have missed something profound. So your words lived on my screen, unread, for several days. Do you mind if I leave some words? I am just talking– not advancing a point intentionally. …maybe that tangent demonstrates some ways we made different choices in our lives. It might make me seem distant, perhaps like someone trying to introduce something horrible and alien to make you feel better by contrast (or make you feel terrible in solidarity). No, I am just 'talking' to you like I started writing for Dr. Lancaster. At office hours on Monday, she made me some tea and created a space for me to linger. "–I know you have a literature background like me," she said. "Yes, although I don't pretend to be expert…"
"True but perhaps that's why you're not connecting as well with the sector analyses in Elizabeth's [Dr. Worden's] class." "I wish I had a better strategy for analysis ~"
"If you're a writer, you should write about what you read. If writing is how you process, you should write as much as possible." To say 'I already knew she was right' would not capture the (I'm struggling for words, Kathryn) manitou/essence/breath of that moment because, of course, I was waiting for an endorsement. It wasn't wrong of me: it was human. I thought I put myself in a position where my worth could be judged by another facet — your editing is my critical analysis (I temporarily shelved Poalo Coelho for Paolo Freire –that's it! That's the nugget!). I don't doubt for a second you're a champion editor. We're talented at our 'other facets' and we deserve recognition — financial, or otherwise. But that rang a little hollow, didn't it? It did for me because I'm also a writer, whether I'm honing it or not. It's still my process… and I haven't quit fermenting with it. …it reminds me of what my trumpeting became (though I wish more for your writing than to become like my music…) — I lightly considering suicide five years ago but it occurred to me that, if I were going to kill myself later in the evening, there would be no harm in taking my trumpet to Riverside Park and just blowing something at full volume… maybe even improvise. Every professional aspiration was gone from my music at that point but, without the words to begin writing, I decided it was worth playing afterall — for the sake of being me. I still do it; my roommate's dog has gradually started howling along with me — it creates an apropos dissonance that's thoroughly cleansing… but I rarely bring my playing out into public space again. Once I create a space like that for writing, will I be able to bring it out to workshop? Can something workshopped go back into the safe-space? …I keep wanting to say I'm sorry because I don't feel like I offered you anything that constitutes a solution. Truly, I just now realized that I've become the analog to the dog, howling along to the music. –but you're not playing alone, writer. This. So much this. I know it’s not the way, but I can’t help aching for it. In some ways MFA workshops were that endorsement, since I worked alongside a group of writers that lifted each other up with critique rather than tearing each other down. Even if people said X, Y, and Z weren’t working, there was always something that was. And when you start trying to publish, you lose that. As someone who has worked on the other side of the desk (who still does), I get that, entirely, but it doesn’t make it much easier for me. I'm a fiction writer, an editor, a reader, and a professor, and this is where I talk about my love of all things language—and, occasionally, anything else I feel like writing about.